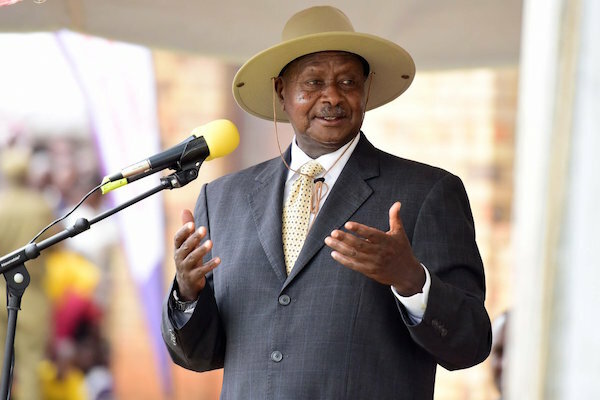 “He will rule for life,” shrugged student and waiter Fahd Sabiti a day after Uganda’s parliament began scrapping presidential age limits, paving the way for Yoweri Museveni to win a sixth term in office. Sabiti’s ambivalence reflected the feelings of many Ugandans used to seeing President Museveni get his way after more than three decades in power. “The opposition politicians who fought yesterday in parliament are just noise-makers. They will fade away,” said the 23-year-old business administration student as he took a break from waiting tables in an upmarket Kampala restaurant. On Wednesday brawls had broken out in parliament before opposition MPs were evicted by security officers as anger over the plan to scrap age limits boiled over. Sabiti was equally dismissive of his fellow Makerere University students who sparred with police and soldiers in days of unrest leading up to the parliamentary vote that kickstarted the process of removing presidential age limits. “You cannot fight someone like Museveni,” said the young man who has known no ruler but the former rebel who seized power in 1986 and has held it tightly ever since. In 2005, when the constitution was changed to remove term limits allowing Museveni to run for a third, a fourth and — last year — a fifth term, Museveni insisted parliament was making its own choices and he would abide by the will of the people. He has taken the same line as the age limit debate has raged in recent days. Nearly three-quarters of Ugandans are under the age of 30, so the overwhelming majority have only ever lived under Museveni’s rule. Now aged 73 he wants the way paved for him to run again, by scrapping the constitutional clause barring over-75s from the presidency. When opposition lawmakers disrupted parliament two days in a row this week, plain clothed security officers stormed in and dragged away protesting legislators. Some MPs and local press identified the officers as being drawn from the elite presidential guards and special forces. Once the chamber was cleared, ruling party lawmakers overwhelmingly assented to the motion which will allow the tabling of a bill to amend the constitution. Standing amid the hot fumes of Kampala’s congested downtown, 48-year-old Solomon Owchi said he’s seen it all before. “Around the time I was born, prime minister Milton Obote abolished the constitution and sent a new one to parliament,” said Owchi, a driver. In 1966 Obote abrogated the constitution Uganda had adopted at independence and loyal lawmakers rubber-stamped a new document which Obote had sent to their parliamentary mail boxes unseen. It became known as the “pigeon hole” constitution. “Museveni was popular once and I think he has done a lot of good for the country, but the people now are frustrated. They are tired of seeing this again,” said Owchi. Owchi pulled a smartphone from his pocket and waved it in the air. “In 2005 when Museveni got rid of term limits we didn’t have this,” he said. An attempt by authorities to block coverage of Wednesday’s parliamentary session and the ensuing brawl and vote failed because video clips were eagerly shared on social media, keeping people such as Owchi informed. Eric Sakwa, a risk manager, had also followed events and, between lunchtime spoonfuls of mashed banana and boiled chicken, he worried about his country’s future. “In business we have this idea of succession planning, but there is no planning for Uganda’s future. We are more-or-less stuck,” said the 52-year-old.